New!! 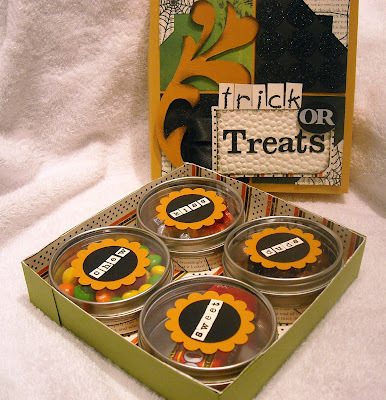 Halloween A La Tarte Kits at OBP! Lime Tart designed Halloweeen Edition A La Tarte kits especially for Odd Bird Planet and they're now in stock! These enchanting kits feature the Bat Gate Odd Bird Planet stamp, plus patterned papers, cardstock, a ghost book, and a great assortment of coordinating embellishments. 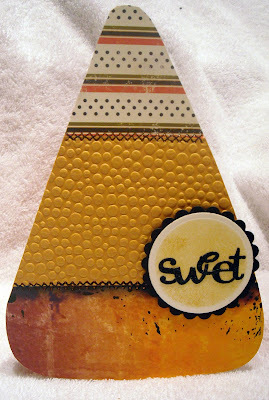 My candy corn card features the cardstock and glittery alphabet stickers from the kit. Also included in the kit is a jar of fabulous black glitter and I'll have a project using that to show you tomorrow! The entire kit, which includes enough supplies to make a boatload of cards, scrapbook pages, and other projects, retails for $39.95. Supplies are limited so fly on over to OBP to pick up your kit before they're sold out! Let love be without hypocrisy. Adhor what is evil. Cling to what is good. do not curse. Rejoice with those who rejoice, and weep with those who weep. high things, but associate with the humble. Do not be wise in your own opinion. If it is possible, as much as depend son you, live peaceably with all men. Wouldn't the world be a better place if we all behaved this way? No one, not even true Christians, can ever attain perfection in this life (although it doesn't hurt to strive for it!) but by trusting in Christ and His power, we have hope that we can achieve some of these lofty goals that Paul, inspired by the Holy Spirit, recorded for us in Romans. I pray this text would be convicting, pointing our our sin as we fail to live up to our calling, and encouraging, seeing how Christ has changed us from what we used to be! Surely, with steadfast prayer, we can trust that we will be changed into more loving, humble servants of Christ! Oh yeah...my card! 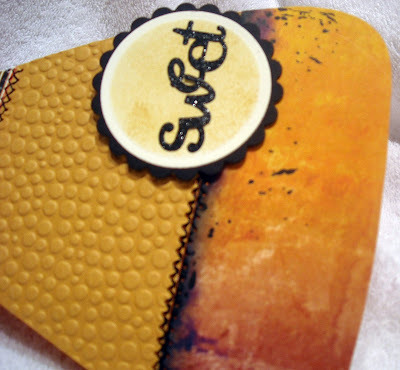 ;-) This is an ATC, created using a new line of patterned paper from SU! the I love! Great Fall colors! My three squares are inchies and are stamped with a long-ago retired SU! set. And my tiny portion of scripture has been attached to two tiny chipboard tags. I think that this could be a very fun bookmark for my prayer journal...Great reminder! If you're still with me after my long winded intro...There's just so much to say with these challenges...please don't forget to hop on over to the SALT blog to check out all the other beautiful creations! This week's SALT challenge was set by Lythan and she picked a fantastic topic - Psalm 139! (You can read her complete write up on the SALT blog). What an incredibly rich and deep text...to contemplate that God, the Creator of all, knows us inside and out - that is a weighty thought. I would love to put the entire Psalm here in my blog but it's on the long side so I will just encourage you to read and study it for yourself. My study Bible titled the Psalm, "God's perfect knowledge of man" and here are some of the thoughts I came away with after reading the text: God knows us intimately. The Psalm states that He knows when you sit down and when you get up, He knows my thoughts before I have them, and knows my path. Verse 2 says that He is "acquainted with all my ways." The Psalmist, David, says that "Such knowledge is too wonderful for me; it is high, I can not attain it." We can't hide from God. Verse 7, "where can I go from Your Spirit? Or where can I flee from your presence?" God is in the heights of heaven, the depths of hell, and in the "uttermost parts of the sea." We could pray for darkness to fall upon us and yet, because night is as day to God, we will not be hidden. We are fearfully and wonderfully made. It is not by chance that you are here, that you are alive, and that you were born when you were born. The Psalm states that we are "made in secret", yet "our frames are not hidden from God" and that His "eyes saw my substance, being yet unformed." Those who love God see Him and His commands as precious and they long to be relieved of remaining sin. "How precious also are Your thoughts to me, O God! How great is the sum of them!" And this is the most profound section for me for it is almost difficult to say the words, considering the impact of what I would be asking of an Almighty God, "search me, O God, and know my heart; Try me, and know my anxieties; and see if there is any wicked way in me, and lead me in the way everlasting." In light of this text, may we all give serious consideration to how God sees us and if we desire to please Him. This was such a sweet Psalm to study and I struggled to figure out what I would create. I'm not a big scrapbooker and really didn't like the idea of putting my face on anything I would scrap but this Psalm is so personal, so searching that I went outside of my comfort zone not once but twice with this creation! :-) Taking some design tips from a SU! 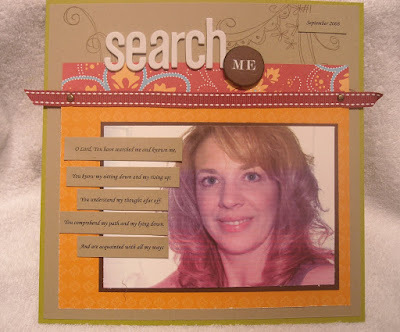 catalog, I choose to keep the layout simple, only adding the first few verses of the Psalm, a title, and my big 'ol face. This piece will serve as a blessed reminder that God knows me, there's nothing I can hide, therefore I can go to Him confidently, through Christ, with my struggles as I praise Him for His goodness and grace in my life. May you all be richly blessed by the beautiful creations the rest of the SALT team have created. Please take a peek and if you're feeling inspired, post a comment along with a link back to something you're made based on Psalm 139. We'd love to share! 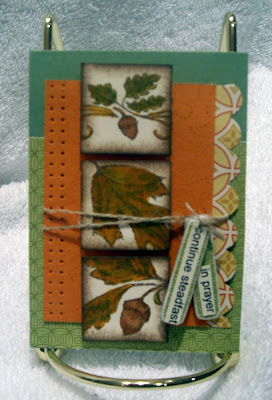 A fun summer time card for the beautiful last few warm summer days we're having here in the Northeast! Makes me think of lemonade...or in this case, I guess it would be "lime"onade! Very simple card showcasing the large lime slice from justjohanna's Odd Bird Planet along with the always clever "pucker up" sentiment. One of my lime slices in covered in sparkly glitter...makes me think of those sugar coated lime slice candies...yum! I feel like it's been ages since I played with my Stampin' Up! stamps and even longer since I posted something created with my neglected SU! goodies! This card was actually made ages ago, maybe over a year, and I've never posted it (at least I hope I haven't and I'm being affected by some sort of memory loss!). This card has a whole lot of layers and weighs about 12 pounds...ok, probably only a few ounces, but it sure is heavy! If memory serves me correctly, and it probably doesn't, this layout is from some SU! publication. It's a great layout, easy to assemble, and I should use this again sometime...The only stamping that was done is on the third layer in where I used SU! 's floral background, topped by canvas background stamps and the main floral image. 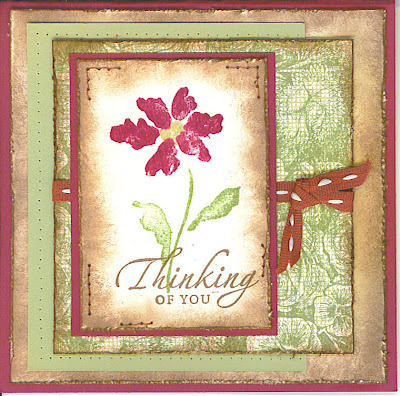 The flower is from a set called Heartfelt Greetings and it's one of my favorites! A bunch of aging on the card because I can't seem to separate myself from my sponges and brown ink pad. Speaking of Stampin' Up! I'm going to be incorporating some general info on promotions, classes, etc. into my blog (as well as posting a huge stamp sale to clear out my retired sets!) so if you like SU! products, check back often. Don't worry if you're in another state or even country, very soon SU! will be offering online ordering - yippee!! I'll also post info on my upcoming classes, just once a month, and if something interests you I'd be more than happy to send anyone supplies and instructions from the classes....you could be a virtual attendee! That's it for me tonight folks...I'm off to get a wee bit of stamping done! I just received some very juicy, secret packages from my friend Johanna over at Odd Bird Planet...ohhh, am I going to have some fun stuff to share over the next few weeks...maybe I'll offer up a sneak peek over the weekend...don't you just love the suspense?! :-) Enjoy! Here's the last card in my "what can you make out of that" series! Gee, it's a series now! LOL! This is my tree made from the Odd Bird Planet floral border stamp (I should really find out the actual name of this stamp, shouldn't I?!) For the tree, I stamped the image twice on kraft cardstock and then colored and cut out the images. Using dimensional tape, I was able to create a bit of depth to the tree leaves. The tree trunk was created by cutting a trunk shape out of a a patterened stamp. The background behind the tree was created by sponging different color inks around and over a torn piece of paper. Again, papers are from K&Co. 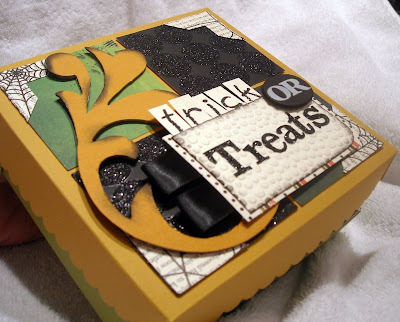 Loved working with this paper pack - beautiful colors and patterns! All those earthy colors that I just love to work with! Happy Tuesday!